Two filters in one box - nice arrangement, I think. This is a picture of the only existing prototype which now isn't even in my possession - could only loan it out yesterday as the 1st production batch is underway already! Main thrust was SERIES filtering where the Highpass out of the first State-Variable Filter feeds the input of the 2nd SV-Filter. Thus you get a MID-band from the 2nd filter's Lowpass output. Block diagram will hopefully clarify! Hopefully this block diagram can help explain somewhat. Two independent or chained 12dB/Oct State Variable Filters with resonance (Q) to self-oscillation. Series - the High output of Filt1 feeds the input of Filt2. Parallel - both filters get the buffered input signal. In this mode the first filter is purely a Low-Pass, while the 2nd has separate Low/High outputs. I was initially just going to have Series but it proved easy to add the mode switch. The Filters are, of course, voltage controlled, scaled to 1V/Oct (haven't confirmed tracking range - imagine 5+ octaves tight tracking) - each one has an FM input (banana) and polarizing depth control. The Int/Ext switches are a weird bonus -> I took the BandPass output from each filter and that feeds the Int switch position for some audio cross-modulation - it can get very gnarly and chaotic, especially with high resonance. The three outputs bands each have a polarity switch (centre-off for quick signal muting) so you can experiment with phase inversion/cancelling before an output level control and buffer. The Low and Mid outputs are normalised to the High section so if nothing is plugged into either then the signal flows on to mix at High. I found this quite powerful - you can either mix in mono from the High output, adjusting the different bands OR perhaps take each output to a different mixer channel & try panning (headphone space out). I'd been keen to start bringing some more stereo action to my setups and while this is obviously just MONO in, the 3 outputs gives some new fun powers. Release date & price TBC - as mentioned, production is underway, but this always takes some time. PS - here's an old recording during proto-times. Good on headphones for head-spin panning. Any indication on pricing yet Tom? Probably a nudge above the PT Delay but below the DRM1. 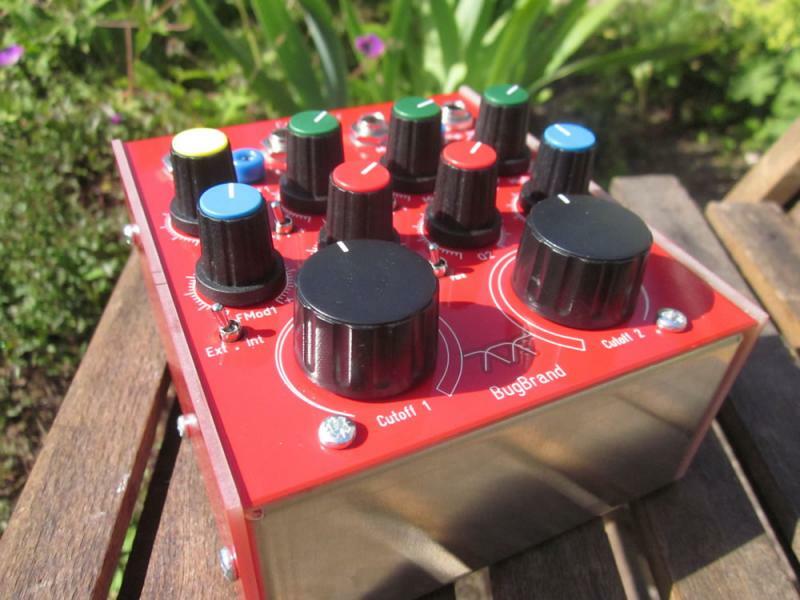 Is there any chance in the future that you will do a run of these that are designed to flow easier with Bugbrand modular systems? Banana-fied and uncased basically? Btw, no offense to your vision and creation. I'm always a bit hesitant to ask things like this to the designers. I feel like that would be like someone hearing my song and saying "any chance in the future that you'll change the chord progression of the verse?". The 1FW Expander will open things up for modular users and won't be available as Standalone as I don't have 4FW cases. 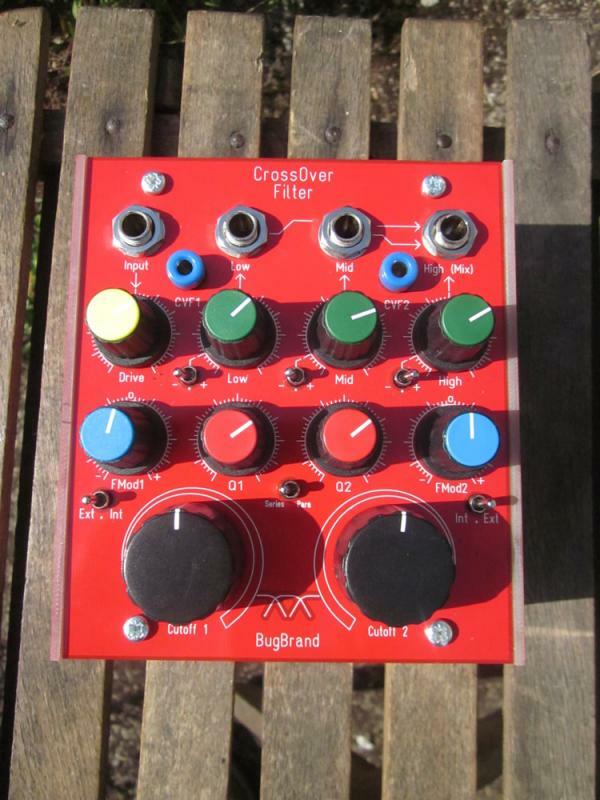 The expander gives individual filter inputs (designed for standard +/-5V audio signals as in the modular), individual Low/Band/High-pass responses for each filter, and a 1V/Oct CV input for each filter. Pics once I've built the first one. You know I've had to make a choice to move from the previous modular work, but I'm also generally trying to design in expansion possibilities to new designs. So, if I am setting this to parallel MID and LOW are both LP outputs from two different (but identical) filters? Yup - may be useful in some instances - it was a simple addition so I figured to go with it - useful too with the Expander panel. Don't get me wrong - I quite like the design! 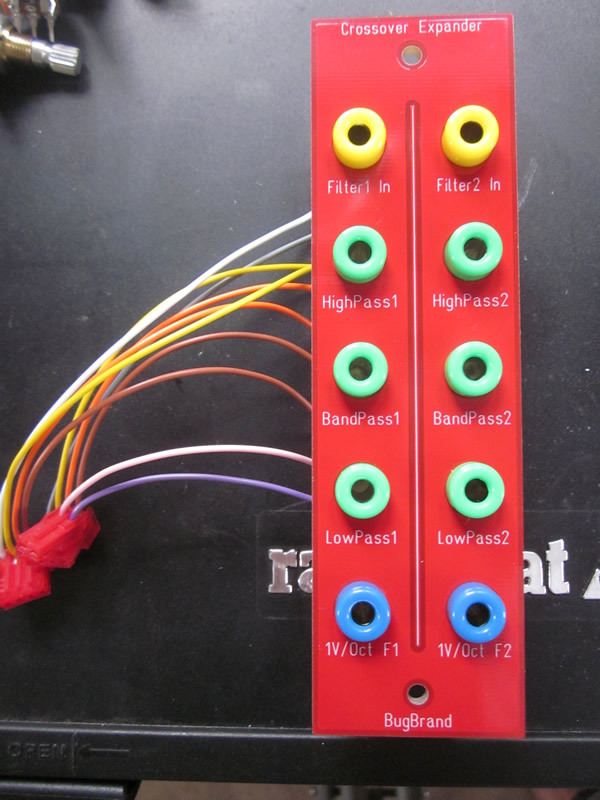 Super simple - passive - just connects to headers on the main module. In essence you then have two completely independent SV-Filters. You could, for example, patch up a 24dB/Oct LowPass or HighPass (must try this actually!) - just use in parallel mode. Too promising design, I have to save some money! Aha! So this will be available uncased. Coolio! Running through the bands of the BugBrand CrossOverFilter. Clean signal loop to begin then Low, Mid and High Bands - for each band, begin with no resonance, then turn it up and also show some gentle Frequency Self-Modulation. 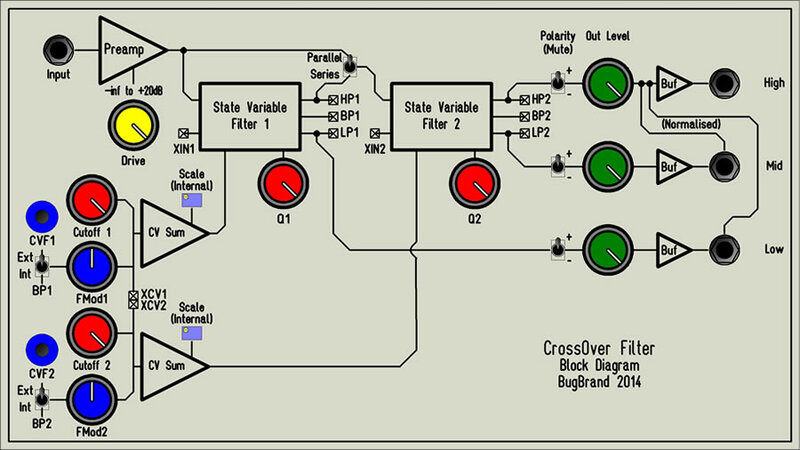 Demo of the BugBrand CrossOverFilter taking the 3 Band outputs to separately panned channels - LOW to left, MID to middle, HIGH to right. Try to listen with headphones! Clean-ish processing beginnings (sweeping with no/low resonance) before becoming more experimental - phase inversion of MID band - Frequency Self-Modulation - then no-input Self-Oscillation tones at the end. The CrossOver Filter processing a pattern on the Korg Volca Beats. Is this the future sound of acid? Truly a beautiful set of demos, Tom. Very nice. Can't wait! Great demos Tom. Love the pings.